Tens of thousands of people have come to Israel from across Africa and Asia in search of better opportunities. In the process, they have revitalized Christianity in the land where it was founded. It is Wednesday night in the heart of south Tel Aviv, an area filled with money-transfer outlets, laundromats, and ethnic food stores catering to the migrant workers and asylum-seekers who populate it. A few blocks from the sprawling Central Bus Station, colorful posters advertise an upcoming concert by Ethiopian singer Mamila Lukas. Various Asian and African languages are overheard on the streets. 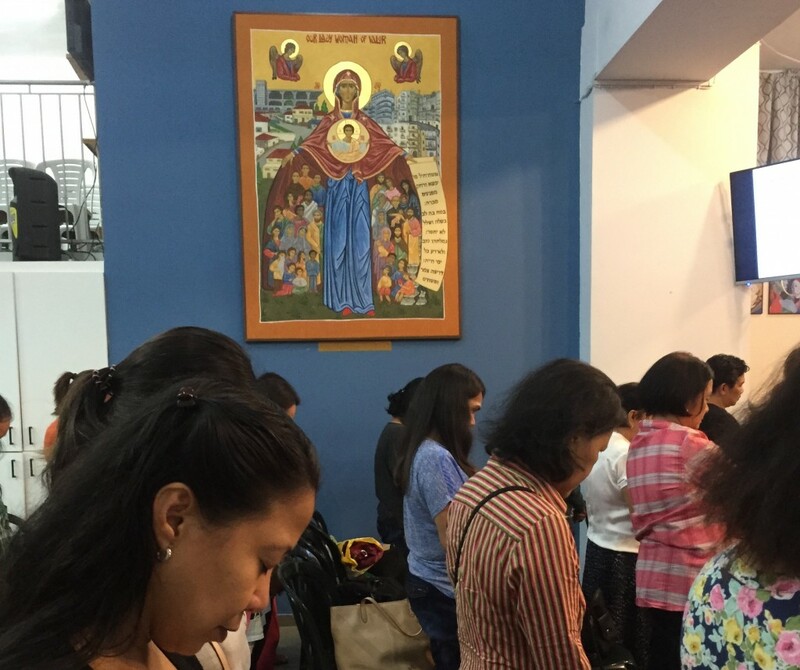 And inside a nondescript white building, a large group of Filipinos have taken shelter from the hustle and bustle and gathered for an hour of prayer. There is no sign on the building, and it easily blends in with the surrounding apartment complexes. But this is a place that in the last two years has become a home and source of strength for thousands of migrants hailing not just from the Philippines, but also Eritrea, Ethiopia, India, and Sri Lanka. This is Our Lady Woman of Valour Pastoral Center, a Roman Catholic chapel and community center that opened in 2014, and it offers a window into the largely overlooked growth of Christianity in Israel. Most of the congregation reciting these words tonight is composed of women who have left their families behind to work in Israel, sending the majority of their money back to children, spouses, and other relatives they do not see for years at a time. The separation from family combined with living in a foreign culture under often demanding working conditions is difficult for many, which is what brings them here tonight. “It gives them much hope and faith to come here,” the Rev. Michael Grospe, a Filipino priest who is the director of Our Lady Woman of Valour, told me after the Wednesday night Mass. 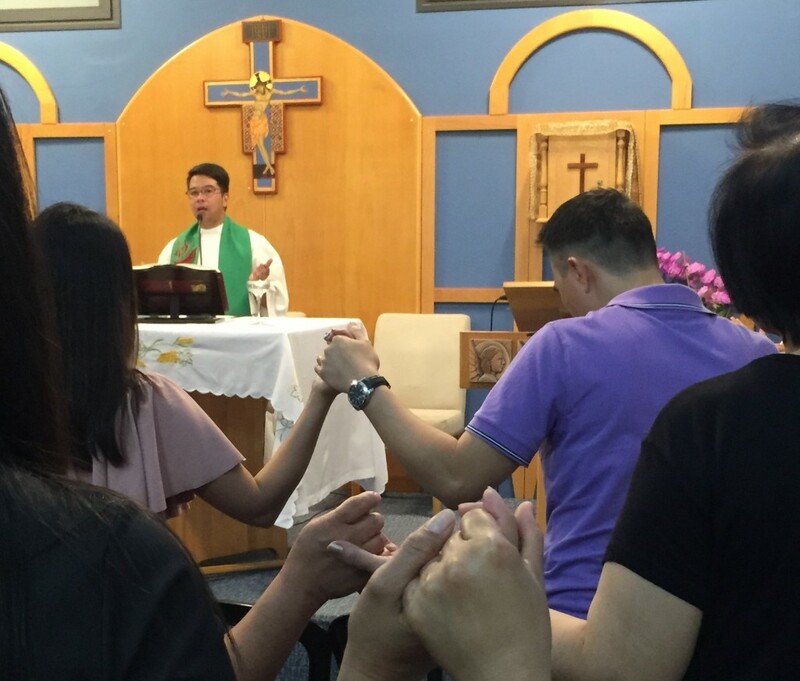 It is also a way to combat loneliness, since the congregants know that family members back in the Philippines—which is 82 percent Catholic—are saying the same prayers. “They can make a connection to their families through these prayers,” Grospe said. “So this is a home away from home for them.” In addition to prayer services and more than a dozen Masses each week in various languages, the center offers daycare, catechism, and after-school programs for children of foreign laborers, as well as a small convalescent facility for migrants who fall ill. But Our Lady Woman of Valour isn’t just significant in the lives of these migrants. Its growth is also a significant development for the Catholic Church, and highlights how, for the first time in nearly a century, the Latin Patriarchate has expanded its property and presence in the Holy Land. Until recently, the Catholic Church in the Holy Land was demographically stagnant. Many churches around the country sat unused, as large numbers of local Christians—who once made up 19 percent of the population of Jerusalem alone—emigrated to other countries. 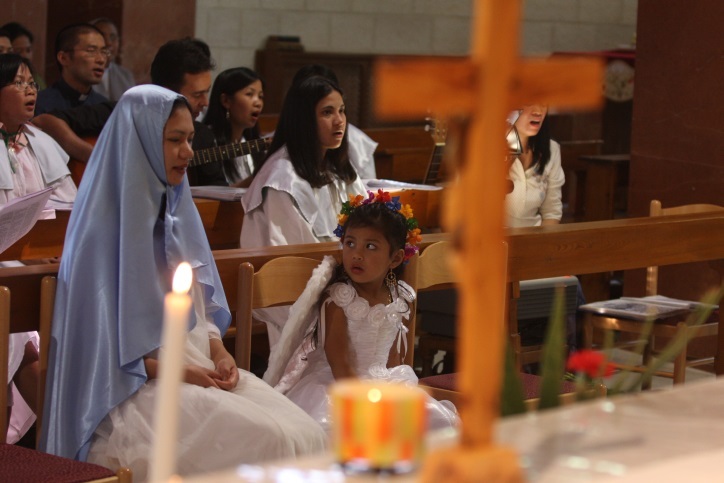 Today, Arab Christians make up just two percent of Israel’s population. But in recent years, the number of Christians in Israel has risen sharply due to the influx of foreign migrants. Many ancient churches, as well as those built during the late 19th and early 20th centuries, when various European denominations increased their presence in the Holy Land, are again in use after decades of little or no activity. And in order to cater to migrants in areas without churches, such as Tel Aviv, new places of worship are being created. “It’s sort of an irony here that the majority of Christians are migrants,” Grospe said. In fact, among Catholics, migrants now outnumber the locals three to one, according to the Jerusalem Center for Jewish-Christian Relations. According to the center, there are about 50,000 Catholic migrant workers in Israel, compared to only about 25,000 natives. It was these large numbers that drove the Latin Patriarchate to purchase and develop Our Lady Woman of Valour, the first Catholic church in Tel Aviv. Migrant workers, mainly from African and Asian countries, began arriving in Israel in large numbers in the late 1990s, when policy changes in reaction to a rise in Palestinian terrorism reduced the number of laborers from the West Bank and Gaza, according to the Hotline for Refugees and Migrants, a non-governmental organization that works to protect the rights of foreign workers and prevent human trafficking in Israel. Today, according to the Hotline, there are about 70,000 authorized foreign workers in the country and another 15,000 without visas. Most work in construction or as in-home caregivers for sick, elderly, and disabled Israelis. In addition, there are about 43,000 asylum-seekers, mainly from Sudan and Eritrea, that have arrived in Israel via Egypt’s Sinai Peninsula during the last several years, according to Israel’s Ministry of the Interior. Israel’s immigration system is based on the Law of Return, which grants automatic citizenship only to Jews and those of recent Jewish ancestry, as well as qualified relatives of citizens; so the influx of non-Jewish foreign workers and asylum-seekers has presented a challenge to policymakers. But despite frequently-changing government attitudes toward the migrants, ranging from temporary amnesty programs to mass deportations, the group has nonetheless emerged as a permanent part of Tel Aviv, Israel’s thriving commercial and cultural capital. Over the last three decades, the influx of these migrants has transformed south Tel Aviv into an ethnically diverse area where the children of workers and refugees from the Philippines, Eritrea, and Sudan play and study together in Hebrew. While ongoing debates over the legal status of these children and the influx of migrants in general often make headlines in the Israeli press, the quiet development of the religious communities that help sustain them has mostly remained under the radar. “People are just not aware of it,” said Hana Bendcowsky, program director at the Jerusalem Center for Jewish-Christian Relations. “Israelis just see the Filipinos as taking care of their grandma. They don’t see beyond that. 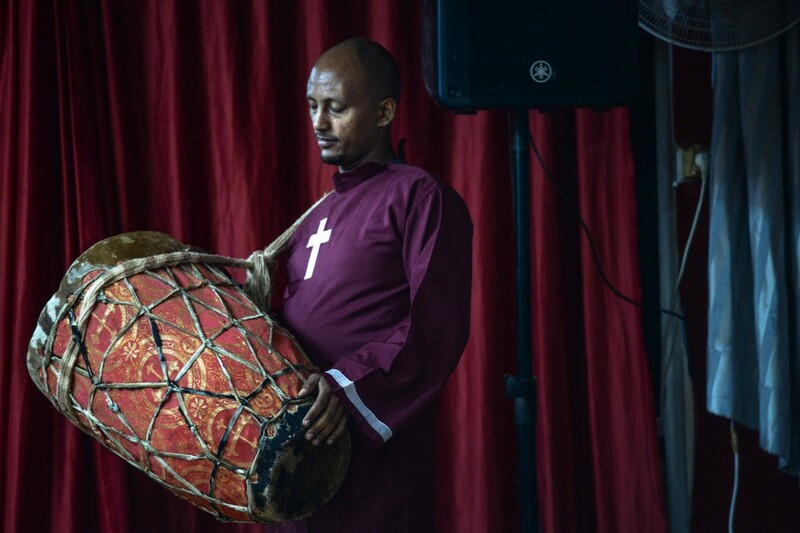 They don’t see a whole Christian community.” But for many of these migrants, religious gatherings and worship are an essential part of their lives in Israel. 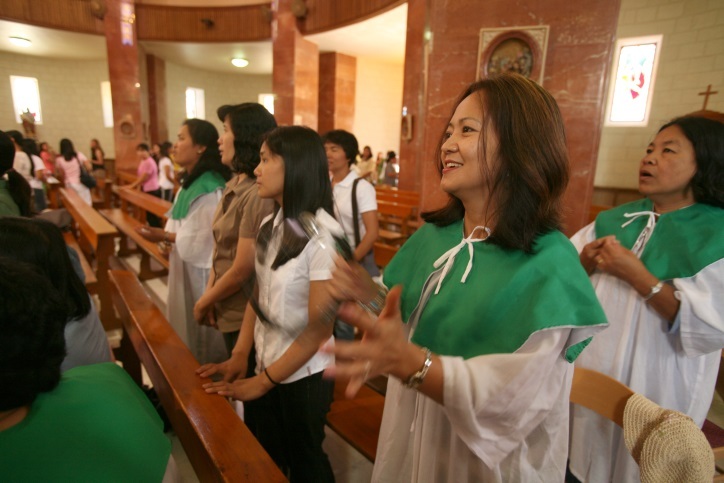 When Gina Canlas left her hometown of Pampanga in the Philippines to work in Israel as an in-home caregiver in 1998, she tried to attend Mass each Sunday in Jaffa, the seaside enclave just south of Tel Aviv. Jaffa is mentioned several times in the Hebrew Bible and is also revered in Christianity. The city is mentioned in the New Testament as the place where Jesus’ disciple Peter resurrected a widow named Tabitha, and archeological evidence indicates the presence of churches since Byzantine times. Canlas especially liked to attend Mass at St. Peter’s, an ornate Franciscan church and monastery rebuilt several times since the seventh century, which serves the city’s Christian Arab community as well as tourists and pilgrims. But Canlas often couldn’t attend Mass because Sunday is a working day in Israel. On days she could make it, she spent more than an hour walking or traveling by public transportation. But for Canlas, who left five small children behind in the Philippines, getting to Mass was a priority, even when it was a time-intensive endeavor. “It has always helped me a lot to get through my work and my daily life,” said Canlas, now 55. 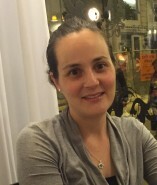 Eventually, after five years in Israel, she switched from working as an in-home caregiver to cleaning houses. This meant she was in charge of her own schedule, and getting to Sunday Mass in Jaffa was a bit easier. Also around this time, Canlas, who separated from her husband back in the Philippines, became pregnant and had a baby boy with her boyfriend, a Muslim Turkish man who also came to work in Israel. In order to give a Catholic identity to her son, who attends Hebrew-speaking Israeli school, Canlas continued her involvement in the church, often volunteering to sing in the choir and serve as an altar attendant. “It’s confusing for my son, so he really needs to see me practicing my religion if I want him to also be Catholic,” she told me. As Canlas’ son grew up throughout the early 2000s, the number of Catholic foreign workers in Israel grew with him, and churches like St. Peter’s began to add Masses in languages like English, French, Tagalog, and Konkani, an Indian dialect, to accommodate the newcomers. Local church officials also granted permission to celebrate Sunday Mass—traditionally held on Saturday night or during the day on Sunday—on Friday and Saturday mornings in order to coincide with the Israeli weekend. The few priests in Israel fluent in these languages were celebrating multiple Masses each week around the country, and trying to tend to the other needs of migrant workers. The Rev. Angelo Isan, a Filipino Franciscan who had been living since 1991 at monasteries in Israel that primarily serve pilgrims and tourists, suddenly found himself catering to the needs of an increasing number of migrant workers from his home country. He came to see helping this community as his most important job. “We are always available for them. It’s our duty to take care of our people,” Rev. Isan told me when I visited St. Peter’s, where he now lives along with five other foreign priests. He said he began to spend a lot of time listening to people, hearing about challenges ranging from expiring visas to their Israeli-born children’s lack of knowledge about Christianity. While it was nice to see more people filling the old churches around Israel, there were also growing concerns about how to effectively meet the spiritual needs of the migrants. “From the one hand, this influx of migrants strengthened the Christian community, but it was a real challenge for the Patriarch,” Bendcowsky said. In 2011, Church leaders in Rome approved the establishment of the Coordination of the Pastoral Among Migrants, an organizational body that oversees the religious needs of foreign workers and asylum-seekers, including making sure there are chaplains, Masses and activities available to each community. The organization also works with various nonprofit organizations and foreign embassies involved in the plight of foreign laborers and asylum-seekers. As part of this effort, in 2014 the Latin Patriarchate acquired the property for Our Lady Woman of Valour. Tel Aviv-based migrants who had been commuting to Jaffa, or attending Mass in makeshift-places like public bomb shelters and apartment buildings, now had a place to gather and worship in or near the neighborhood where they lived. “Really what we have now is a dream come true, and we are making the most of the space,” Grospe said. The influx of Christian migrant workers from places like the Philippines is not a phenomenon isolated to Israel; it is occurring across the Middle East. Of the 10 countries in which Christianity is experiencing its most rapid growth, six are Muslim states in the Middle East, according to the Center for the Study of Global Christianity at the Gordon Conwell Seminary in Boston. In places like Saudi Arabia and Qatar, the number of Christians is expanding at a rate of more than nine percent per year due to the influx of migrant workers. “The arrival of migrants to the Middle East has fundamentally changed Christianity in the Middle East,” said Gina Zurlo, assistant director of the Center for the Study of Global Christianity. In places like Saudi Arabia, where there is no freedom of religion, migrants are forced to gather in secret to worship. But in other countries, like the United Arab Emirates and Qatar, officials have allowed the construction of churches in certain places. This is all happening as other places in the region, mainly Iraq and Syria, have seen continuing violence against Christians that has driven out entire communities. “While everyone is talking about the exodus of Christians from the Middle East, that exodus is being offset by migrant workers,” Zurlo said. In Israel, this influx has resulted in a fusion of identities, especially among those migrants who have been here for many years. It is even more pronounced among their Hebrew-speaking children. Canlas, who has temporary residency status in Israel, speaks mainly Hebrew with her Turkish boyfriend and son. She said she feels comfortable as a Catholic in Tel Aviv. The identity of Catholics like Canlas is captured in the logo of Our Lady Woman of Valour, which hangs on one wall of the chapel. The colorful logo depicts the Virgin Mary gathering people of different races and cultures under the protection of her robes against the backdrop of South Tel Aviv landmarks, including the Central Bus Station. One of Mary’s hands holds a scroll with the Hebrew words of the 31st chapter of Proverbs, beginning with “Eshet chayil, mi yimtza”—“A woman of valor, who can find?” The text goes on to describe a brave and capable woman who loves God and takes care of her family. These verses are traditionally sung at Jewish Sabbath tables on Friday night. The inclusion of the Hebrew scroll on the church’s logo serves as an inspiration for the many women working abroad and reminds community members that they are guests in a Jewish country, Grospe explains. Christians in Israel still face many challenges, as both Muslims and Jews have been implicated in incidents of vandalism and persecution against churches and Christian communities in recent years. Although only seven percent of Arabic-speaking Israeli Christians said they felt discriminated against last year, according to a survey from the Pew Research Center, there are large gaps in public opinion between Christians and Jews in Israel. For example, only 28 percent of Israeli Christians think it’s feasible for Israel to be both a Jewish state and a democracy, whereas 76 percent of Jews believes this combination is possible. Some Church leaders have also been critical of the separate administrative nature of the migrant communities and the local Arabic-speaking communities, a gap that the Coordination of the Pastoral Among Migrants is trying to bridge through more cooperation and joint activities.